See the rules for all our exhibits by clicking the “Rules and Regulations for Exhibits” link below. Our exhibition entry form can be downloaded by clicking on the “Exhibition Entry Form” link below this paragraph. Please print two copies, complete both copies, and bring them to receiving with your artwork and entry fee (we accept cash or checks). 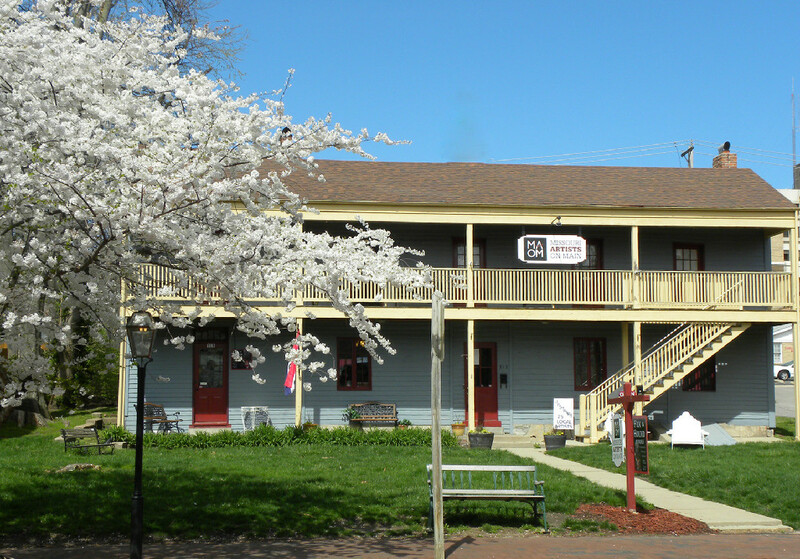 CJ Muggs, located at 101 W Lockwood – Webster Groves, MO 63119, (314) 963-1976, offers exhibition space for members of the Saint Louis Watercolor Society, changed out quarterly, with no entry fee or commission. We have disbanded themes so members can submit whatever they like. There is space for about 30 paintings. Paintings must be framed under Plexiglas. Please contact Loretta Pfeiffer or Mary Berry Friedman, to participate. There will be a one hour time period immediately after our membership meeting to drop off submissions for the change out exhibit, and a half hour, from 8:30 to 9:00 a.m., the following morning for submissions and retrieval of previous submissions. Dates of Change Out: on the third Wednesday of the month after the membership meeting for 1 hour or from 8:30 to 9:00 a.m. the following morning for the months of January, April, July and October. Note: In July there is no membership meeting so come to the restaurant on the third Wednesday of July at 9 p.m. or from 8:30 to 9:00 a.m. the following morning. We are excited to announce that our 21st Annual Membership Awards Exhibition, Big Splash 2018, will be held at Norton’s Fine Art & Framing, located at 2025 S. Big Bend Blvd., St. Louis, MO 63117, 314-645-4040. Show entry is open to STLWS members who paid their annual dues by July 1, 2018 and artwork (limited to one painting per artist) is to be hand delivered with an entry fee of $15. All paintings must be for sale with a commission retained by the gallery on sales. Complete rules for exhibitions are printed in our 2018-2019 Membership Directory distributed to members and can also be found on our website: www.stlws.org, along with the entry form. The rules were amended in June , 2018 so please be sure to read them. Receiving will be held on Friday, September 21st from 11 a.m. to 4 p.m. Our Opening Reception with refreshments will be on Saturday, September 29th from 4 to 6:30 p.m. with awards announced at 5 p.m. Retrieval will be on Tuesday, October 30th from 10 a.m. to 5 p.m.
Gallery hours for our exhibition, September 29th – October 27th, are Tuesday – Saturday, 10 a.m. – 6 p.m. For more information on Norton’s Fine Art & Framing, directions to the gallery and parking, please visit their website: www.nortonsfineart.com. Please click here for a downloadable map for parking. Click here for printable version of the e-card. We are pleased to announce our 2019 Annual Juried Exhibition will be held at the Missouri Artists on Main Gallery, 321 South Main, St. Charles, MO, in April from the 5th to the 27th with the opening reception on April 5th from 6:30 p.m. to 9 p.m. with the Awards Ceremony at 7:00 p.m. Receiving will be held at the gallery on March 30th from 9 a.m. to 2 p.m., and retrieval of artwork will be at the gallery on April 28th & 29th from 11 a.m. to 4 p.m. The gallery is a beautiful facility, has a lot of visitors, and the staff does a very professional job of representing the work. This show is always an excellent exhibition of the work of area watercolor artists. Gallery hours: Mon-Sat, 10 a.m. – 5 p.m., Sun., 11 a.m. – 5 p.m. Gallery contacts: (636) 724-1250, by email at jmcmullen@aol.com, or visit their website: maomgallery.com. The exhibition is “juried” for acceptance as well as judged for awards, and the juror/judge will be Fealing Lin, a master watercolorist and educator.